Hey, nobody’s right all the time. As an excuse for misbehaving, Groundhog Day might be the worst holiday on the calendar. Why would anyone want to roll out of a warm bed before dawn on February 2nd to get drunk and unruly? Maybe I’m not giving it a fair shake, because I’ve never actually participated in a Groundhog Day celebration. There are a couple of reasons for that: One is that groundhogs don’t live on my side of the country. Another is that I don’t need a rodent to tell me when spring will arrive; when stores start having sales on their winter merchandise, it’s a sure sign that spring is on its way. As you know, that’s the folklore associated with Groundhog Day. Supposedly if the groundhog emerges on February 2nd and it’s cloudy, that means spring will come early. On the other hand, if it’s a sunny day — enabling the groundhog to see its shadow — it dives back into its burrow, signaling that winter will last six more weeks. That tradition has been going on for quite a while now, with communities throughout the U.S. and Canada holding ceremonies. The best-known is in Punxsutawney, Pennsylvania, which is roughly 80 miles northeast of Pittsburgh. 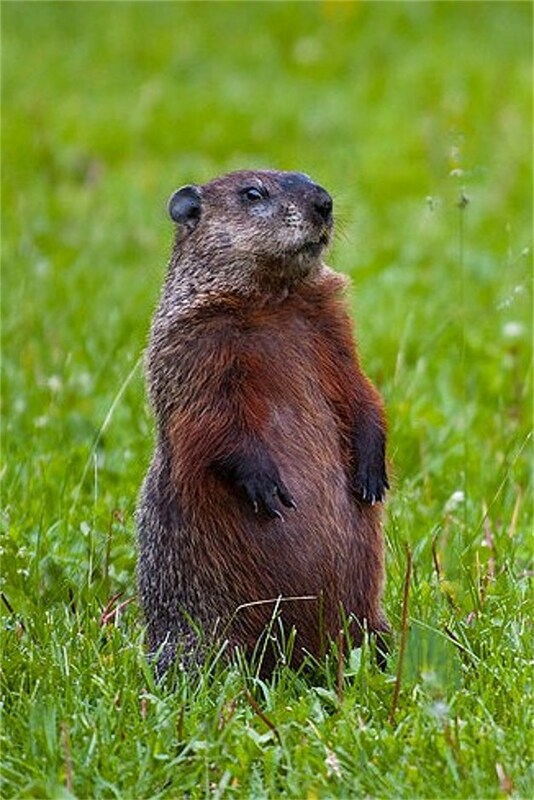 The citizens of Punxsutawney have been coaxing a groundhog out of his hole on February 2nd every year since 1887. Record keeping was spotty in the early years, but through 2012, Punxsutawney Phil, as the rodent is known, has seen his shadow 100 times. Presumably the guys in top hats who preside over the ceremony could also see their own shadows. I don’t get why they need to bother the little guy — let him sleep in, I say. But then, I’m sort of a bah-humbug guy on St. Swithin’s Day, too. Actually, the job of being Punxsutawney Phil (the occupant of that position changes every few years, for the inevitable reason) is pretty cushy. Most of the year he lives in the town’s library and is well fed. Your typical groundhog in the wild weighs less than 10 pounds, but the current Phil tips the scales at around 15, soaking wet. It’s the early wake-up call on February 2nd that kind of takes the fun out of being Phil. How would you like to be hauled out of bed on a cold morning to realize that thousands of people have gathered to stare at you? So, you’re probably wondering, how are groundhogs’ skills at forecasting the future? Well, slightly better than the guys who write predictions in Chinese fortune cookies, I suppose, but frankly — not great. Encyclopædia Britannica says, “Convincing statistical evidence does not support this tradition.” The National Oceanic and Atmospheric Administration (NOAA) is similarly unimpressed. After reviewing a chart of groundhog predictions vs. subsequent weather patterns, NOAA bluntly states on its website: “The table shows no predictive skill in the groundhog.” Stormfax pegs Phil’s accuracy rate at 39%, which is about as reliable as flipping a coin. But don’t let me be a wet blanket if you want to get out there and party at 8 a.m. in 30° weather. I just know that if I did that, there’s a high degree of statistical probability that it would mean six more weeks of a bad cold. This entry was posted in Holidays and tagged Groundhog Day, Punxsutawney Phil. Bookmark the permalink. When I heard an Ohio prosecutor was asking for the death penalty for the groundhog who predicted early spring this year but it kept snowing, I couldn’t believe someone would be stupid enough to believe Phil could predict the weather. Then I learned it was a publicity stunt. Either way, boo!